January is the month that we plan and prepare for the busy season of spring that will creep up on us before we know it. Use this month to study your trees and plan the styling changes that you will effect this spring. Photographs and/or sketches, and notes will help remind you of what you had in mind, when the busy season arrives. Do not trust your plans to memory. I carry my memory around on a clipboard. On those trees that I plan to remove branches, I indicate those branches with a twist-tie. Other treatments to branches can be indicated by using different colors of twist-ties. Make sure that you keep notes on what each twist-tie indicates. 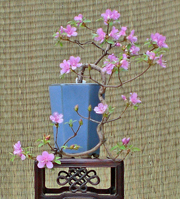 For ideas of styling on some of your trees, look at pictures in books and magazines. Somewhere there is a picture showing you just what you want to do with a particular tree. In your styling plans, do not forget the roots. Your other planning tasks are repotting. Select the pots that you will use for your trees. Identify which pot goes with which tree. Again do not rely on memory. Include in your notes how and where the tree will be positioned in the pot. During my styling planning, I decide which is my front and indicate it in the pot using a wire staple or other marker. The more notes, indicators, sketches, photos, etc. that you produce during this planning month, the easier and faster your tasks will be when the spring rush begins. Lastly, before that spring rush begins, you should have your potting soils ready. If you mix your own or modify purchased soil to your own formula, now is the month to do it. 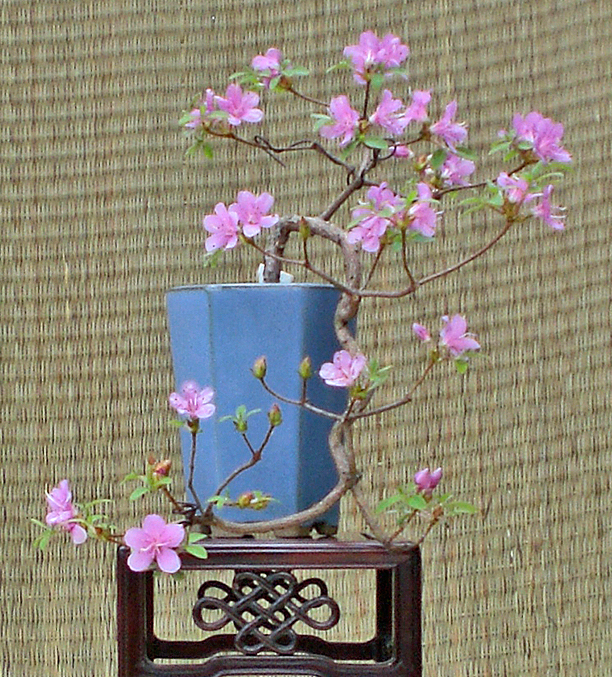 Azaleas require some special care different from your other trees. For starters, I mix my azalea soil 30% sand, 30% turface and 40% bark. If you purchase your soil, add more bark depending on the soil mix. Get it ready this month. On plants that are to be potted this spring and plants that were potted last spring, the flower buds will have to be removed. Start watching flower bud development. Some varieties set and grow buds early while others are very slow developing. As soon as I can remove the buds easily, I get started, usually in the latter part of the month. The Satsuki plant is essentially dormant at this time of the year. No activity can be observed in the shoots. Root activity is minimal. Keep those “diomorphic” leaves cleaned up. Be alert for pests and diseases. Keep watch on moisture in the pots. Warm weather has a way of creeping up on us and all of a sudden we can be faced with more work than we can handle. This is the planning month. Use it to good advantage.